"I may vote Republican, but I'm a firm believer in gum control." 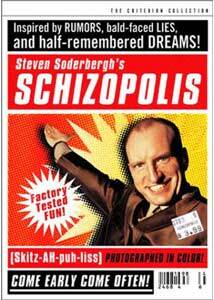 Steven Soderbergh is a strange fellow. I had suspected this fact for a long time, but this viewpoint recently was blinded by such stylish mainstream pictures as Erin Brockovich and Ocean's Eleven. This bald guy in glasses does not bring to mind a powerful film director, but Soderbergh has quickly become one of Hollywood's major players. Studio leaders would probably not want to view Schizopolis before choosing him for a sizeable project. This assertion doesn't imply that this film isn't enjoyable and clever, but it definitely would fly right over the heads of dollar-focused executives. This low-budget picture often left me scratching my head with confusion, but it rarely provides a dull moment during the silly presentation. The picture begins with a prologue showcasing Soderbergh in front of a curtain giving a brief introduction. His words place the onus of understanding the material squarely on the viewer, and he blames us if it makes little sense. Of course, this scene is satirical and untrue, but it does nicely precede the upcoming events. Soderbergh stars in two roles as the dull businessman Fletcher Munson and his strange doppelganger, dentist Dr. Korchak. Munson works for the self-help guru T. Azimuth Schwitters (Mike Malone)—an unfriendly individual who requires his workers to craft his motivational speeches. Munson spends his days daydreaming about crazy activities and taking calls from mysterious people who want to infiltrate the company. Are they figments of his imagination, or will they really pay him to reveal confidential secrets? Have you followed this plot so far? It gets much weirder. Munson has a generic wife and child and has become embroiled within a dull, predictable family life. Soderbergh effectively skewers their relationship by having the couple speak such lines as "generic greeting" to each other instead of the usual words. Later in the story, Munson is dubbed in several languages, but the context is easily understandable. Mrs. Munson is played by the director's ex-wife Betsy Brantley, which adds an eerie real-life spin on the couple's interaction. Her character is having an affair with Dr. Korchak, but she doesn't seem to realize his striking resemblance to her husband. Midway through the film, the tale follows the Lost Highway route and shifts to Dr. Korchak's perspective on events. Munson spots the guy entering his car in a parking lot, and we join his doppelganger for a significant time period. Complicating matters even further, Betsy Brantley returns as Attractive Woman #2, whose looks cause Dr. Korchak to write her a surprisingly explicit love letter. Scenes also repeat themselves from different viewpoints, which is less interesting than you might expect. Schizopolis is the type of movie that splits audiences drastically depending on their expectations of the typical film. Certain viewers will find its oddball satire clever and entertaining, while others will deride it for offering a thin plot and emotionally detached characters. On a whole, I enjoyed this movie's unconventional tone but did find that it dragged a bit during its second half. The story also includes the oxygen guy who speaks in meaningless babble to seduce housewives, which works better than the description would imply. Also worthwhile are the random news briefs and expert discussions that barely relate to the characters but provide silly moments. Soderbergh deserves credit for crafting an interesting picture on a shoestring budget. He returns for a final Q at its conclusion, but in predictable fashion the responses make very little sense. Image Transfer Review: Schizopolis contains few moments of visual grandeur, and much of the humor relates to the witty dialogue. So there isn't a major requirement for a top-notch visual transfer. However, this 1.85:1 widescreen transfer nicely conveys the quirky film while providing few remarkable visual moments. A decent amount of grain does appear on the screen, but it rarely distracts from the presentation. Audio Transfer Review: Criterion was almost certainly limited by the low-budget nature of this picture in presenting an audio transfer. This mono track provides a solid experience and makes the dialogue clear and easily understandable. However, its technological limitations keep everything very centralized. The overall result is sound that is never distracting, but rarely offers anything above-average. Extras Review: This Criterion Collection release includes a solid collection of extra features that often match the film's oddball nature. The most prevalent is a commentary track from Steven Soderbergh playing a reporter interviewing himself. The excited guy asks questions and sets up the director to be silly and skewer the nature of DVD commentaries. This track does include some enjoyable moments, but it becomes tiring after a decent listen. It actually generates a reaction very similar to my thoughts about the film itself. Also amusing is Maximum Busy Muscle, a collection of about eight minutes of additional footage. Easily the most memorable scene involves Soderbergh donning a large afro, which obviously looks very strange. This disc also includes a more straightforward commentary track from producer John Hardy, actor/casting director David Jensen, actor Mike Malone, and production sound mixer Paul Ledford. This group all appear together and prodvide an informative discussion about the low-budget production. The remaining supplements include the theatrical trailer, an interesting print essay, and the usual Criterion color bars. Schizopolis is equally fascinating and frustrating, with moments of near-brilliance occurring alongside tedious sequences. Considering that his career wasn't rolling at the time of this release, I applaud Steven Soderbergh for taking a chance. He doesn't always succeed, but the overall result is a entertaining and interesting picture.